Are you looking for adaptive sport and recreation equipment to make your initiative more inclusive? Are you planning a new para sport or recreation program but are in need of the proper adaptive equipment? Do you want to try a piece of adaptive sport equipment to see if it is something you would use to stay active or like to purchase in the future? 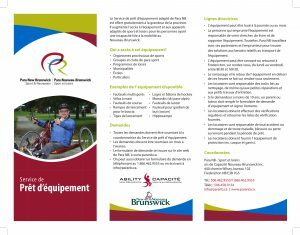 The Para NB Equipment Loan Service is a provincial, bilingual service that aims to increase access to adaptive sport and recreation equipment and devices for persons with a physical disability in New Brunswick. 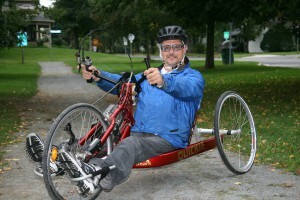 The Service can be accessed by provincial sport organizations, recreation organizations, para sport groups, municipalities, schools and persons with a physical disability throughout New Brunswick. Examples of the type of equipment available for loan include: multisport wheelchairs, handcycles, rugby chairs, boccia ramps and balls, bowling ramps, hockey sledges, sit skis, curling sticks, a throwing chair, and a racing chair. Contact Para NB to request equipment! All requests for equipment loan will be made to the Para NB Equipment Loan Service Coordinator by submitting the Para NB equipment loan request form at least 1 month prior to the date equipment is needed. The request form can be signed, scanned and emailed or faxed to Para NB. If requested equipment is not available, the applicant will be notified within 7 working days and will be placed on a waiting list. Successful applicants will be contacted by Para NB and required to execute an equipment loan agreement and adhere to following the daily maintenance, minor repairs and cleaning of the equipment that is required to perform and record regular checks using the checklists associated with each piece of equipment. Requests will be processed in the order they are received and equipment will be allocated according to program/individual needs. Where requested equipment is unavailable, the applicant will be notified within 7 working days, will be placed on a waiting list and notified when equipment is available.